A number of sites and YouTube personalities have already reviewed this group of coolers, so we thought we’d try something a little different. 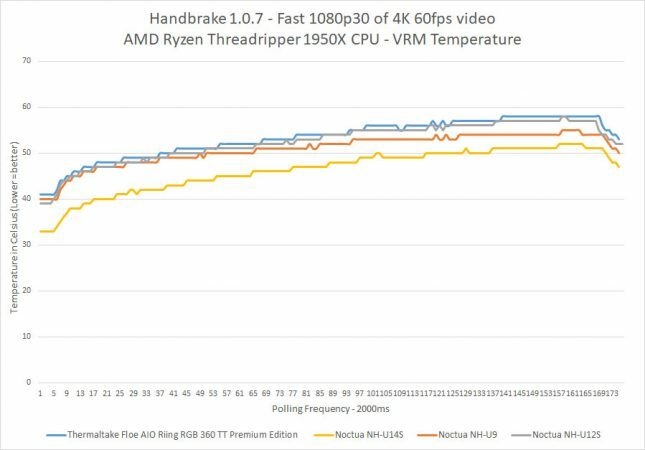 Rather than running a stress test like AIDA64 or Prime95 we thought we’d look at CPU cooler performance with real world applications. For the first benchmark test we used Handbrake v1.0.7 and used the Fast 1080p30 option to shrink down a Big Buck Bunny, Sunflower version 4K 60fps movie clip (download it here). This is a fun test as it’s a real world workload and something we often use. 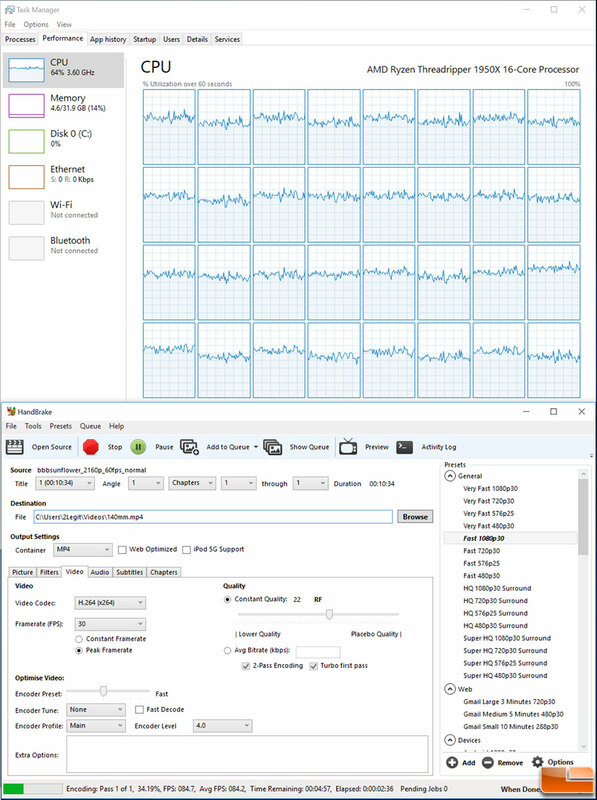 This application uses all 16-cores, but doesn’t put each core to full use. 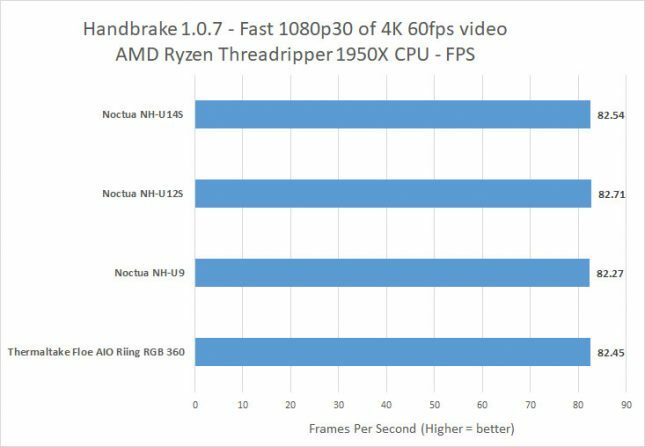 That means we end up with around 50-70% CPU usage on the AMD Ryzen Threadripper 1950X in stock form. 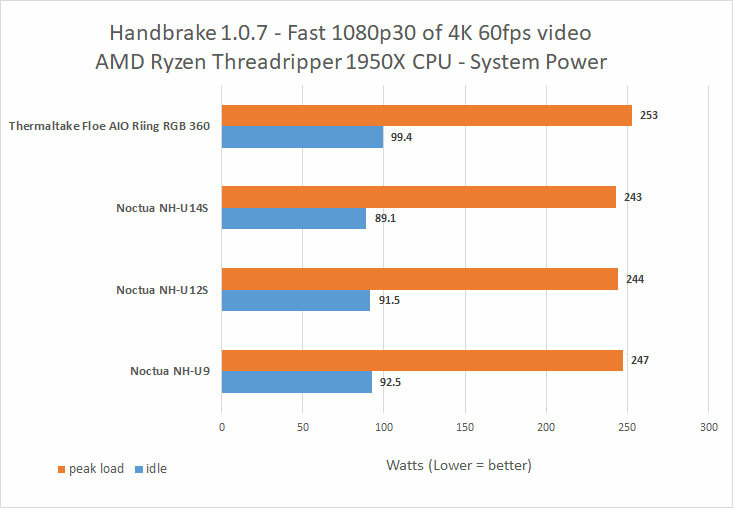 The CPU Package Power was around 178 Watts, so this looks like a good test for a 180W TDP processor. Keep in mind that the AMD Ryzen Threadripper 1950X processor is rated at 180W and 68C is the maximum temperate for precision boost to operate and if 95C is reached it will trigger a thermal shutdown to prevent the CPU from being damaged. We are well below the max temperature, but we are hitting the max temp where precision boost will operate. 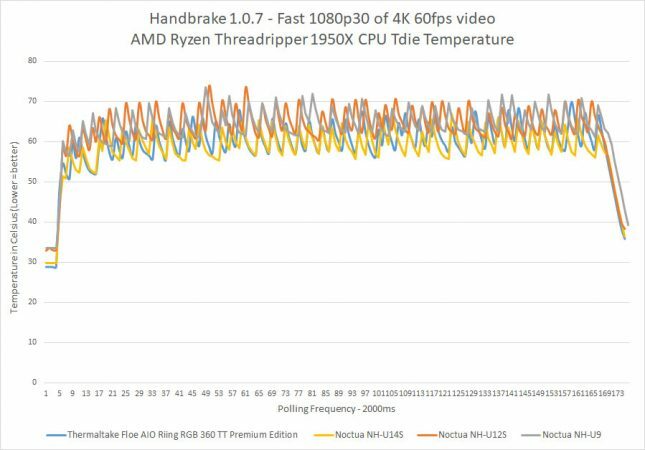 When you look at performance over time you can see that the temperatures are all over the place, but the Noctua NH-U14S and Thermaltake Thermaltake Floe Triple Riing RGB 360 are typically lower than the rest. It’s fun to look at peak temperatures, but this is what the CPU temperatures really look like when you are running Handbrake on all 16-cores. This Handbrake test takes only about six minutes, but you can see the CPU temperatures are pretty consistent. We also didn’t notice any throttling or clock clock differences between the four coolers, so it wasn’t a shock when the project’s all completed within 0.5 FPS of one another. 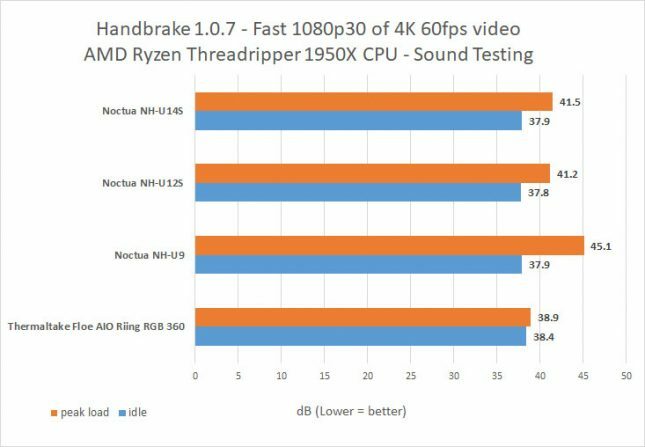 When it comes to noise levels the dual 92mm fan setup on the Noctua NH-U9 TR4-SP3 was the loudest at load at 45.1 dB with the fans hitting 1900 RPM. 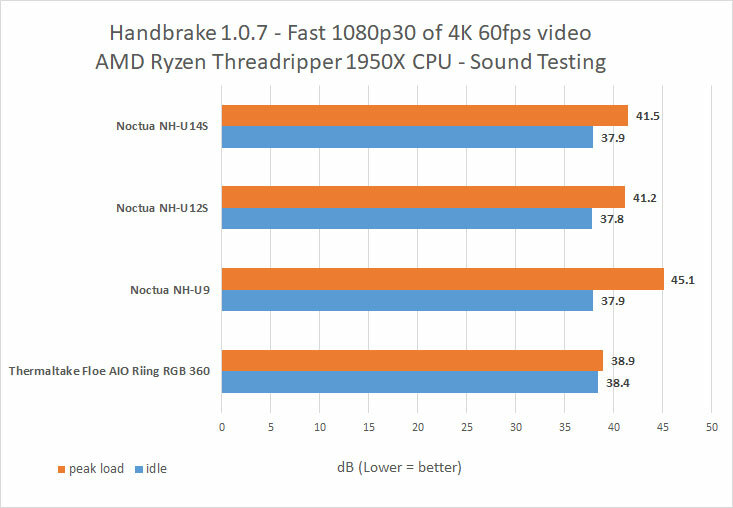 The Noctua NH-U12S TR4-SP3 and it’s single 120mm fan spinning at up to 1500 RPM came in at 41.2 dB and then the larger 140mm fan on the Noctua NH-U14S TR4-SP3 produced 41.5dB. Not bad noise levels in a room with an ambient noise level of 37.1dB. At load the Thermaltake Thermaltake Floe Triple Riing RGB 360 was the quietest of the bunch, but that is because the VRM tempearture was below 60C. Once the VRM fan kicks on at 60C on the ASUS ROG Zenith Extreme X399 motherboard ($499.99 shipped) we found the noise levels would approach 50 dB, so at really heavy loads that put the VRM over 60C none of these CPU coolers will be the loudest thing in your system. If you look at VRM temperatures on our open air test system you’ll see that with the Thermaltake Thermaltake Floe Triple Riing RGB 360 the VRM temps are the worst as there are no fans to blow air over any of the components. The Noctua NH-U14S keeps the VRM temps the coolest, but we dropped the graphics card down a PCIe x16 slot in the board to fit the cooler and that needs to be taken into consideration. The Noctua NH-U9 has a dual 92mm fan setup that appears to have cooled better than the single 120mm fan setup on the NH-U12S. Lastly, there is overall system power draw that one needs to be concerned about as energy efficiency is an important thing to remember. It shouldn’t be too shocking, but the Thermaltake Thermaltake Floe Triple Riing RGB 360 came in with the highest idle and load power draws. This makes sense as it has three fans, a water pump and RGB lighting over the one or two fans on the Noctua air coolers. Let’s look at a different workload and wrap this up!